Step 1: Follow the vendor’s instructions to install the configuration utility on your Windows computer on your home network. Plug the GS105E port 5 into your home network. Out of box, the GS105E will obtain an IP address from your home router. You may wish to hold the factory reset button to restart from this step. Note: ‘Reserve’ an IP address on your home router if it has this capability to avoid future collisions with other devices on your home network. If your router does not have reservation capability, pick an address that would be unlikely to be assigned out, e.g. if router DHCP range starts at 100, pick something above 200 (but < 255). My router assigned 192.168.1.22. I designated a static address of 192.168.1.205. Step 2: Create Vlan ID “10” under the VLAN->802.1Q->Advanced->VLan Configuration. Ignore the Port Members for now, these are set in next steps. What do these settings do? The switch is configured to have two sets of ports, “LAN” and “WAN”. Two Virtual Local Area Networks (VLAN) are created to represent these separate networks. The Ubiquiti firmware knows Vlan “1” as the WAN port. We will configure Vlan “10” to be “LAN” ports on the hamnet mesh network. 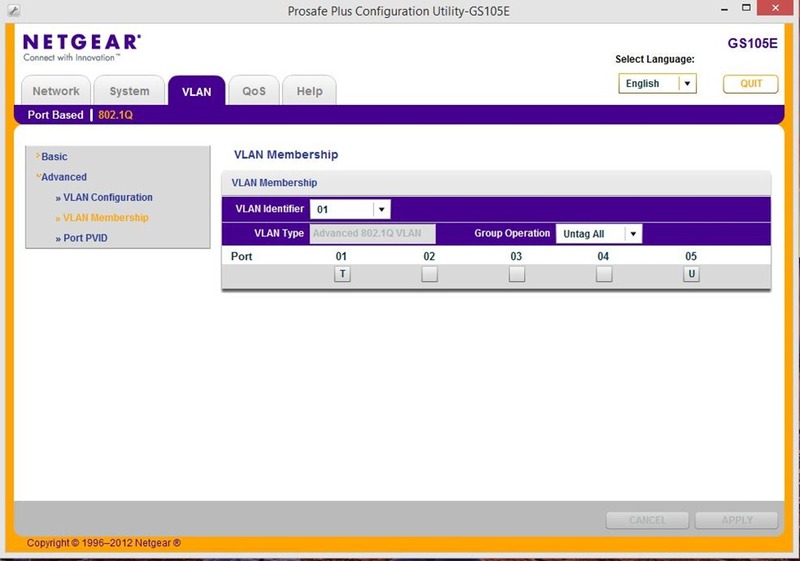 Step 3: Assign ports 1 and 5 to Vlan “1” under “VLAN->802.1Q->Advanced->VLAN Membership”. What do these settings do? This setup screen is configuring the switch what to do with the Vlan tags of outgoing packets on the given port. 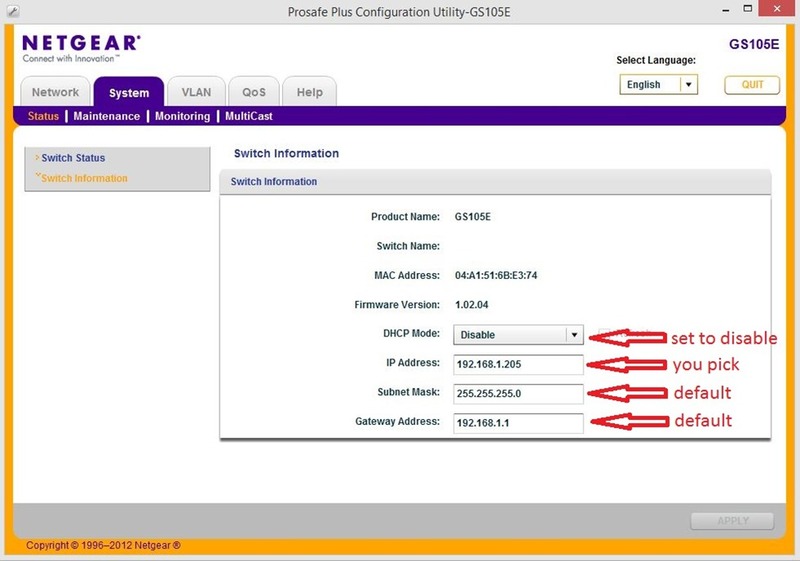 The switch already knows where an incoming packet came from, Vlan “1” or “10”. Refer to Step 5 and recall that Vlan “1” = WAN and Vlan “10” = LAN ports. The “T” on port “1” means tag all the outgoing packets to the connected Ubiquiti that they are coming from Vlan “1”. Packets could only originate coming in on port “5”, the only other port on Vlan “1”. The packet must be tagged on Vlan “1” so that the Ubiquiti will recognize the packet as coming from the ‘WAN’ port “5”. The “U” on port “5” means remove the Vlan “1” tag as the packet goes to your home network. Packets could only originate from the Ubiquiti device on port “1”, the only other port on Vlan “1”. Your home network does not need to have packets tagged for a Vlan and conflict with other Vlan setups you may have. Ports 2, 3, and 4 are empty and thus, not part of Vlan “1”. Step 4: Assign ports 1, 2, 3, and 4 to Vlan “10”. Select “VLAN Identifier” “10” on the same settings window. What do these settings do? Ports 2, 3, and 4 become the “LAN” ports available to plug in a computer, webcam, or other device on to your hamnet mesh network. All packets outbound from the Vlan “10” ports have the Vlan tag removed, designated by “U”. The Ubiquiti recognizes untagged packets as originating from the LAN ports. Any device plugged into a LAN port does not need to be aware of Vlan tags in the packets. Port 5 is not part of Vlan “10”, the “LAN” ports. 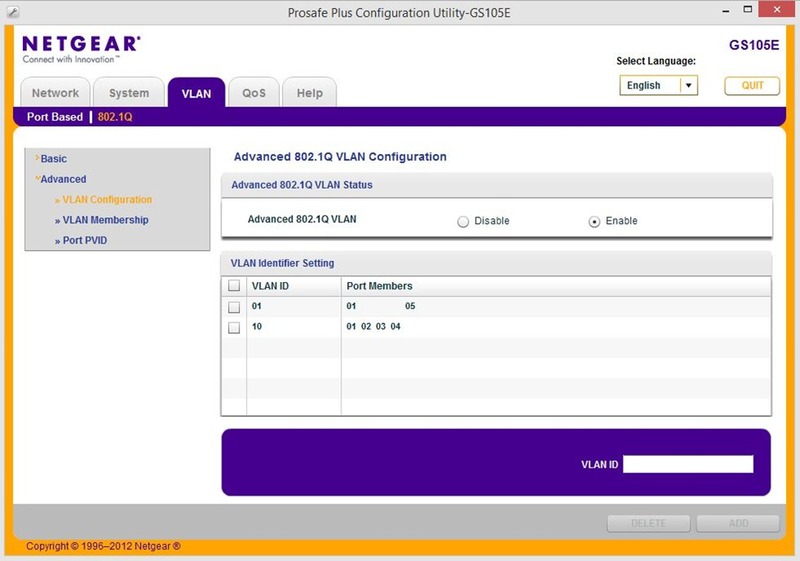 Step 5: Configure the Default Vlan tags to incoming packets under “VLAN->802.1Q->Advanced->Port PVID”. What do these setting do? When an incoming packet is received on a port, if it does not already have a Vlan tag, one must be added to designate what ports the switch will send the packet back out. The Ubiquti already tags packets destined to the WAN on Vlan “1”, so the GS105E leaves the tag alone. The untagged packets form the Ubiquiti are designated on Vlan “10”, and subsequently sent to the LAN ports.